Här finns en växande samling bilder och filmsnuttar från diverse skidturer – framför allt från toppturer i Norge, svenska fjällen, men också turer till Alperna och Klippiga bergen. 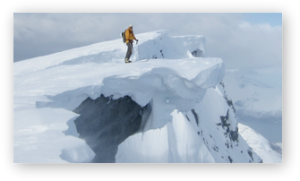 Here is a growing collection of pictures and movies from different ski trips – mainly backcountry skiing in Norway, the Swedish mountains, but also trips to the Alps and North America. I just have to make some advertisement for my totally awesome skis – made by Hendryx, a tiny boutique style ski maker with very original ideas. 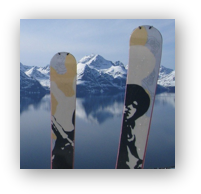 Click here to see what I wrote about the skis at the Teton Gravity Research web forum. 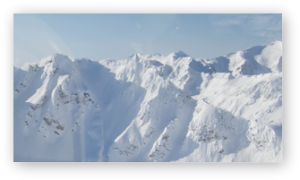 Teton Gravity Research Forums > Tech Talk>Who has ridden Hendryx skis? Hi! I have ridden on Hendryx skis - Purple Haze (182 cm, 149-110-143) - for two seasons and must say these skis are absolutely awesome! Never skied anything close to these -- they carve like mad, surf in powder and are superfun. I ski telemark, and have the NTN bindings mounted in a strong duck stance -- which the skis were designed for (see the Hendryx website, www.hendryxskis.se, for more thoughts/explanation on this), and I never believed one could have such incredible edge control. No matter how fast you ski, they just carve and let you lay down low, low, low (see the cool short video that's now on the Hendryx web)... as somebody said earlier in the thread, the skis are made with a particular way of skiing in mind, for which the short radius makes sense -- although it doesn't mean you have to go super short turns all the time; they're great for fast, big turns down the mountain. I've been skiing in resorts about half the time (Chamonix, Whistler, Revelstoke and Alagna last year), and the rest ski touring (mostly in Lyngen, Norway, and last year also a week in Selkirk, British Columbia). Although not the lightest ski, they work really well up the hill as well (and yes, no problem skinning with the duck stance!). I came across this thread as I googled to see what people's experiences are from last year's versions where Hendryx added more rocker to several of the models (my 09 Purple Haze are flat, no rocker, while last year's model has some moderate rocker). My guess is they are even better, and even more quick and playful, so I'm now facing the nice dilemma of choosing what new model to buy for this year -- considering both the Funkallistic, the Cash and the 917, although, perhaps, the Purple Haze I already have are the perfect allround model -- works excellent in basically all conditions (hard to believe, I know). I realise I must sound very partisan, but I'm honest... just blown away by the skis and the originality of this tiny company. Try the skis if you have the chance! Link to forum thread here. Text, bilder och filmsnuttar från en tur till Lyngen i Nordnorge -- sjätte året i rad. Det börjar kännas som en tradition man inte kan bryta! 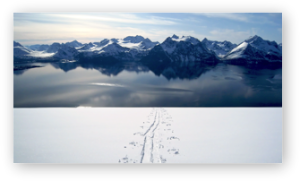 Text, pictures and slideshow from the annual ski trip to Lyngen, Northern Norway – sixth time now. Här faller 30 meter lätt, fluggig snö varje år.Text, bilder och ett bildspel med musik från en fantastisk vecka med Selkirk Mountain Experience – rekommenderas! This incredible place at 2000 meters altitude gets 30 meters (100 feet) of snow each winter! Check out text, pictures and a slideshow with music from one of my best skiing weeks ever. Highly recommended! Årets Nordnorgeresa! Med Isak, Beau och Aaron. Spektakulärt! The yearly trip to Northern Norway. This time with Isak, Beau and Aaron. Spectacular!